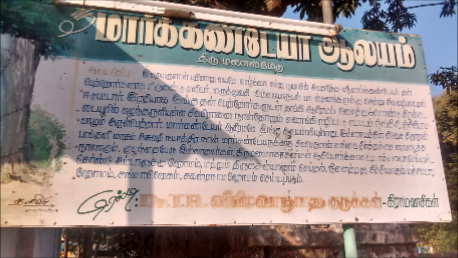 This board in Tamil states that temple for Lord Vishnu and Goddess Lakshmi ( named Sri Amirtha Narayana perumal and Goddess Amirthavalli ) is 10 minutes from Thirukadaiyur. It requests devotees to visit this temple also and get Their Blessings. The photo above is outside Sage Markandeya temple . It is said that he is the son of Sage Mrukanda and Maruthuvathi and was born after a lot of tapas. 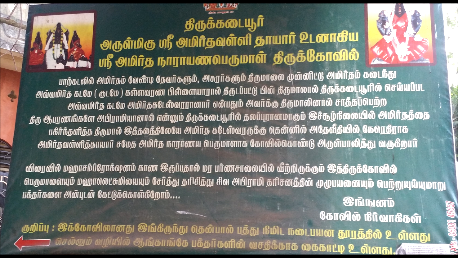 He did penance here ( Thiru manal medu ) to ward of danger that was to occur at the age of 16. This village is one kilometre from Thirukadaiyur. It is said that a pilgrimage to abode of Goddess Abhirami and Lord Amirthakateswara is complete only if we visit this temple too. There is the Devasthanam guest house outside the temple. Since we did not go inside I have no idea about it. 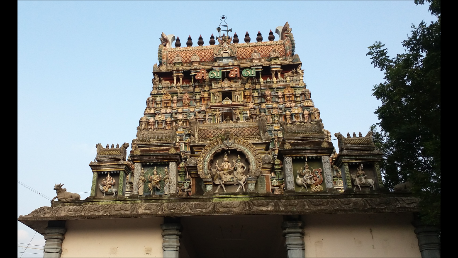 About a kilometre before the temple is the accommodation offered by the Tamil Nadu Tourism Development Corporation. Apart from this there are lots of private guest houses or hotels. The room rents are like this Rs.1000 for a double bed accomodation and Rs.1500 for a triple bed room accommodation. Some hotels have Deluxe accommodation also. The facilities inside are good with air conditioner ( though we did not need it because of the Margazhi season ). Storage water heater facility is available. Food is also quiet decent in some hotels. The advantage of staying is Thirukadaiyur when we travel from Chennai ( some prefer Mayavaram or Kumbakonam ) is that the following parihara sthalams are nearby. Keezha Perumpallam ( Kethu sthalam ) is 24 km away. What we can do is , if we are travelling from Chennai it takes about 5 hours if we go directly to Thirukadaiyur. So we may reach in time for the morning darshan. We can book an accommodation, ( nowadays it can be done online also , according to the hotel manager ) . Then we can go to Thirunallaru and return . If we return in time, as we did we can have one more darshan at night. The next day in the morning we can go to Budhan or Sukra Sthalam and return . After lunch we should start at around 3 pm so that we can go the Vaitheesawaran koil , Keezha Perumpallam and Chidambaram depending upon the availability of time and return to Chennai via Chidambaram. This temple is associated with "Amritha " the Nectar for which the Devas and Asuras fought. 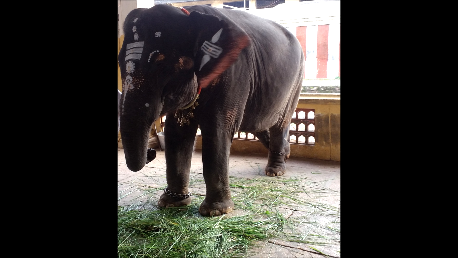 The sannidhi of Kalla Varana Pillaiyur ( Lord Ganesh ) who took the Amrita Kalasam is in this temple and hence associated with this legend. The blessings received by Sage Markendaya from Lord Shiva who saved him is also at this place according to mythology. Recently ( few centuries back ) Goddess Abhirami blessed Abhirami Bhattar . Abhirami Bhattar on Thai Amavasai ( Amavasaya after Makara Sankranti ) told the King, Sarfoji of Thanjavur ( he was a Maratta King ) that it was a full moon day but it was actually a new moon. Pleased with Bhattars prayers that is sang in the form of Abhirami Andhadi , Goddess threw Her huge ear rings called Thatanka in the sky and the brilliance made it appear like a full moon ! So overall it is a very Punya Kshethram and we have to visit .